Join us for a pint every 4th Thursday! Being a photographer can be a lonely life. We’re always out and about meeting new people and taking great photos, but how often do we just sit down and talk photography over a pint? The answer is once a month. Our monthly social is usually informal. Often we’ll use it as an opportunity to plan upcoming outings, and some bring photo gear they are looking to sell so it can be a great chance to grab a bargain. Anyone is welcome to stop by, grab a drink and see what’s going on. 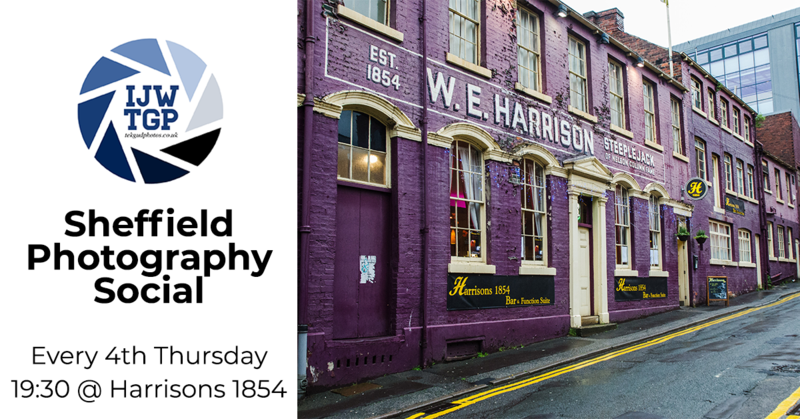 Not to be confused with Harrisons Cameras, Harrisons 1854 has been our monthly base for many years. It is a handy location for most, being just off West Street in Sheffield City Centre. They have a well priced selection of local ales plus your usual selection of lagers. There is also free wifi, hot drinks, card payments and all the usual facilities. Keep an eye on our Facebook Group to find out what’s planned for next month.